Continued Constraint-based programming of tower, introduced data trees, introduced techniques for paneling/structuring a surface. 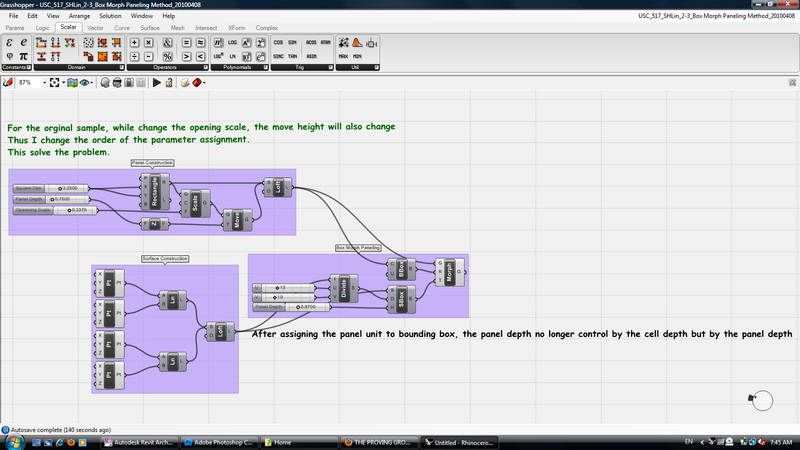 Continued Constraint-based programming of tower, introduced data trees, introduced techniques for paneling a surface. 1. What are the possibilities for creating new programatically-driven tower forms? 2. What is the relationship between the the tower's program and its structure and skin? Think about the possibilities with image mapping to a facade! As a follow-up to my question in class about syncing Excel with Grasshopper, I found this to be a helpful blog post, as well as a site which attacks GH, scripting, VB and more as a holistic work-flow. I am still interested in advancing beyond the XYZ coordinates of a point by finding methods to assign unique IDs to points (or objects too). Additional dimensions of data assigned to an element of geometry seems essential to preserve 4D and 5D data exchange between a hearty BIM model and Grasshopper. There is a problem with the parameter order of the panel cell. While changing the opening size, the cell height will also change. However, after the panel cell assigned to Morph Box, the depth was driven by the boubdubg box, not the cell height anymore. 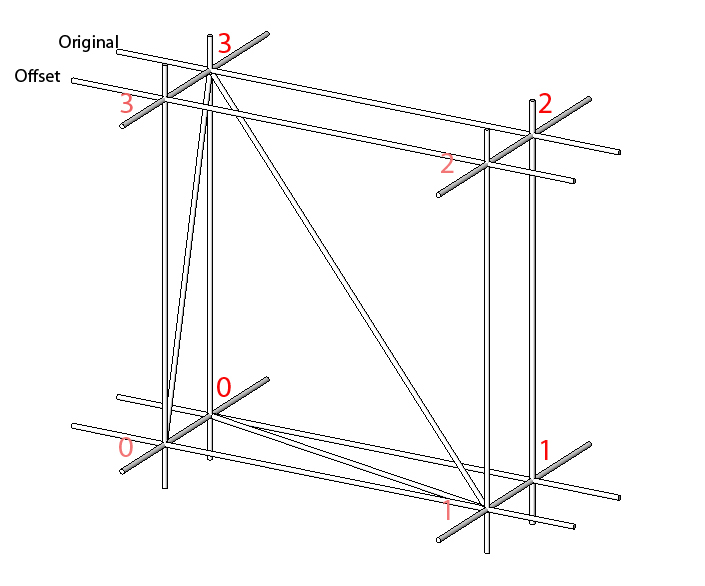 Share a useful diagram for constructing the space truss. I'm not sure if you guys vertexes numbering are the same as mine. You might want to double check. Diagrams like this are perfect for the seminar topics pages to explain different Grasshopper concepts and parametric relationships as they relate to creating building systems… this one would fit nicely in the Structure + Skin topic. I am having difficulty with my truss outer lines. Does anyone know how to connect the edge points of the truss with a line? 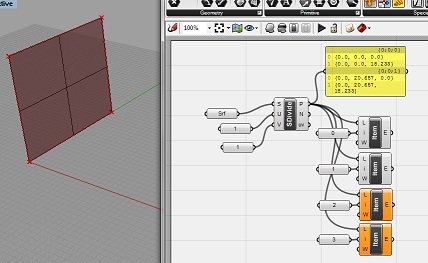 If I create a surface in Rhino by either lofting 2 curves or extruding a curve, set it in Grasshopper, and then use Surface Divide; my corner point values are 0,1,0,1 instead of 0,1,2,3. Listing the items with the integer set to 2 and 3 queries no data. Any thoughts? I don't have this problem if I create the surface by lofting curves in Grasshopper, dividing that surface, and then creating a separate subsurface, though. I am having a difficult time recreating what you have described. Could you post some files so I can have a look? Surface Divide (SDivide) outputs a Data Tree that is organized by rows… for example, a divided surface that is U: 20 and V: 10 would have 20 rows containing 10 items each. If you want to divide the surface so you have points for paneling, please refer to the technique described in the file "Week 2-2_Surface Division Method.ghx" from last week. The reason I ask is that one of the tutorials posted showed this method as a way of getting corner points from a surface. The technique from the week 2 file is clear to me, however, if this is an alternate way, then it is less steps. The answer lies in how Grasshopper organizes lists and data tree hierarchies. The SDivide component creates list of points organized by rows and columns. It will not sort points for creating quads. To get quad vertices, you need to be explicit in 1. defining a surface domain list which maps out quad sections on a surface and 2. extracting the corners from the quads. By going through these steps you are setting up a hierarchy of relationships that you then use to drive more complex objects like structures and panels. See this image for the difference. 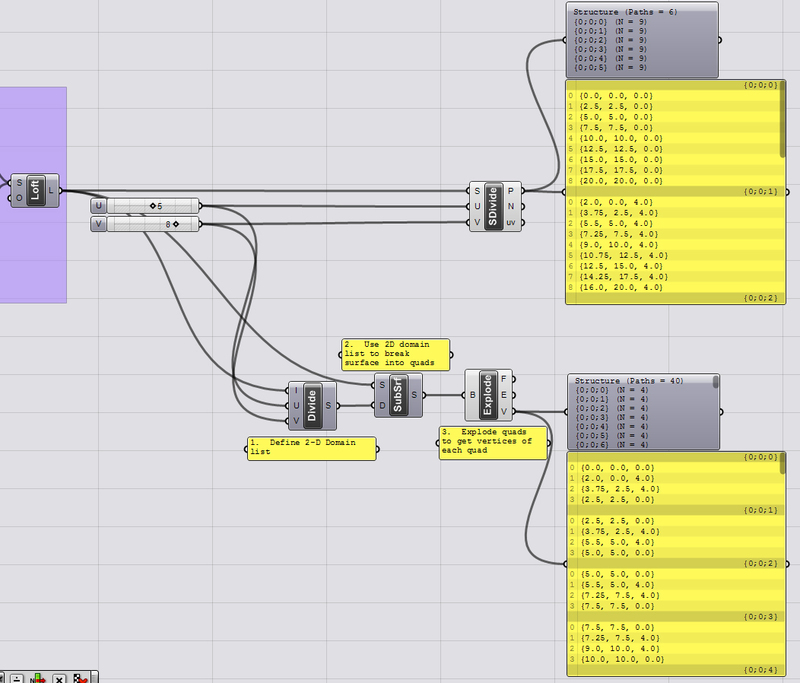 Note the data tree viewer and the panel displaying the lists. Mohamed, Eve, and Jeff have some great process (files and images) posted on their pages. Actually the post right above helped me out a lot. Thanks. It depends how you define a space truss. Historically, space trusses often have an offset sub-surface with nodes shifted to the midpoint of the sub-surface above. Has anybody developed their definition to shift the offset surface? Any other creative variations? Image capture to post on my page. How do you capture the screen image to jpg. I have my mac and I made a truss but I am using bootcamp for windows and I can't remember how to do it. I use a Mac too… I haven't looked too deep into the issue so I use the "On-Screen Keyboard" found under Start > Accessories > Accessibility … this keyboard has a Print Screen key. There may be a better way. If you need a screen capture of just your Rhino window you can use the command "ScreenCaptureToClipboard" which will copy your active Rhino window. You can then paste it into a Photoshop file. For MAC users, F14 replaces the print screen button. So it's Ctrl+F14. how do we export/save jpg images from Rhino ?